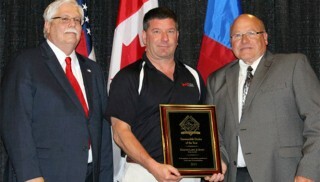 A BRP/Ski-Doo dealer in Minnesota has won the Dealer of the Year award from the American Council of Snowmobile Associations. Duluth Lawn and Sports won the award, which is given annually to retail dealers that have proven to go above and beyond in supporting their local and statewide snowmobile clubs and organizations. Duluth Lawn and Sports has been in business since 1991 and has been an active member of the Black Woods Blizzard Tour for nearly two decades, raising thousands of dollars for ALS research each year. It is also a huge supporter of MnUSA, the statewide association, where the dealership pays for customer memberships at their open house each fall – last year that was 58 memberships. With local clubs they are very involved in projects that include providing sleds and equipment for Veterans Rides, promoting snowmobiling at city, county and state meetings and protecting access and trail rights at anti-motorized meetings.